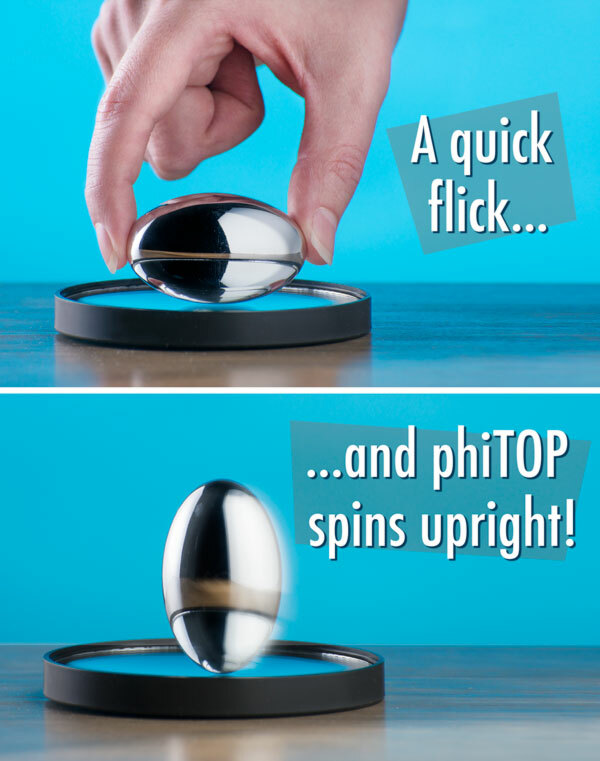 PhiTOP: Spinning aluminum top shaped like an egg. PhiTOP is a spinning top reimagined. Part art and part science demonstration, the oblong figure’s proportions are engineered with the golden ratio as measurements for its axes. This ratio results in a kinetic sculpture that mathemagically stands on its end when you twirl it. The dynamic desk toy is made from solid aluminum with a mirrored finish. Using the included convex mirror platform (and a bit of practice), you can enjoy spins that last several minutes. Decorate your desk with a sublime spheroid and give PhiTOP a spin! Spin up PhiTOP and watch it go. Then keep watching, 'cause it’s going to keep spinning for a while. 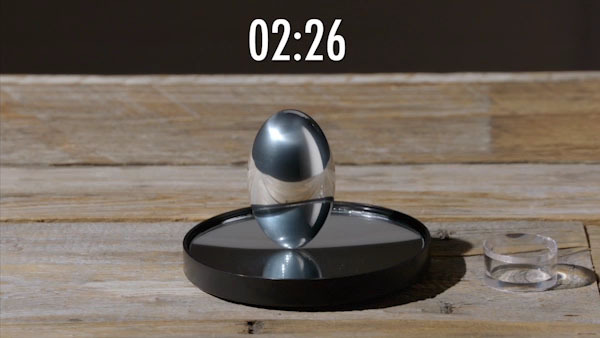 As it spins, it'll stand upright and play some pretty trippy tricks on your eyes. Even at rest, PhiTOP is a thing of beauty to behold. Forget whatever you're working on and set your eyes on PhiTOP, your new desktop prize. To get PhiTOP started, set it on the the mirrored base with the long axis parallel to the table. Grip it with your thumb and forefinger and give your wrist a flick to give your flashy football some momentum. When left to its own devices, not only will it spin for an incredibly long time but it will also stand up as it continues to twirl! When you spin a PhiTOP with lights around, you're treated to a bonus light show you never saw coming. Single points of light are stretched and distorted into a beautiful variety of painted light circuits called Lissajous figures. Normally, creating these patterns requires specialized equipment like an oscilloscope or pendulums paired with harmonographs. 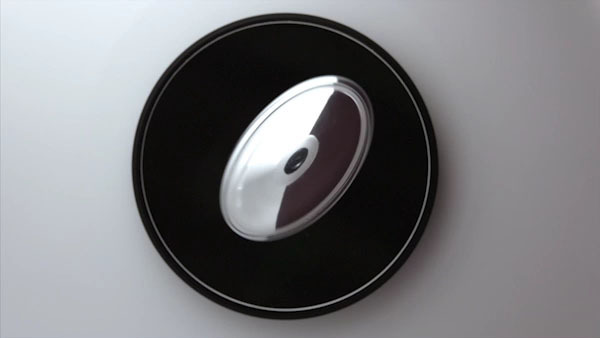 PhiTOP accomplishes them with its own mirrored surface and the light bulbs in your room. So crank up the Pink Floyd, twist up PhiTOP, and tune out. 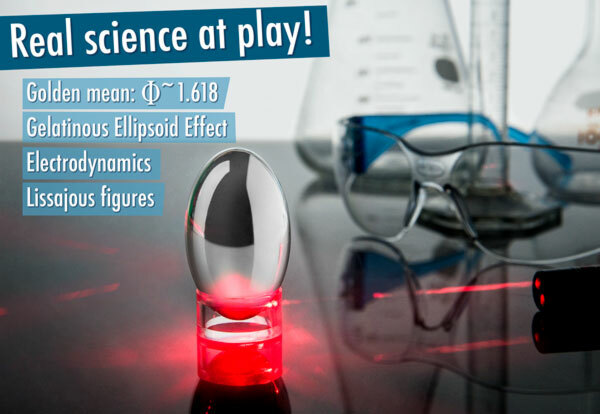 From its very design, PhiTOP embodies a number of fascinating physical and mathematical properties. For those of you that didn't rush a fraternity or sorority in college, Phi is a Greek letter that, in math notation, represents the golden ratio. This is a special relationship that appears repeatedly in nature, and PhiTOP was created based on these divine proportions. It's this shape that gives the dynamic top the ability to magically stand upright when spun. 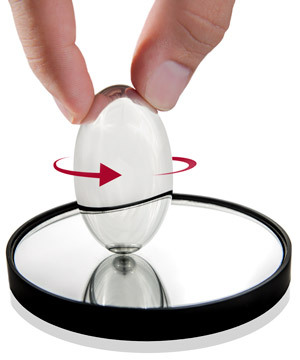 The same shape also allows the aluminum egg to be affected by electromagnetism despite being made of non-magnetic material. This demonstration of Lenz's law can be seen as you bring a magnet near the spinning PhiTOP. PhiTOP isn't only about revealing hidden truths of the natural world. It's also a means of tricking you into seeing things that aren't real! 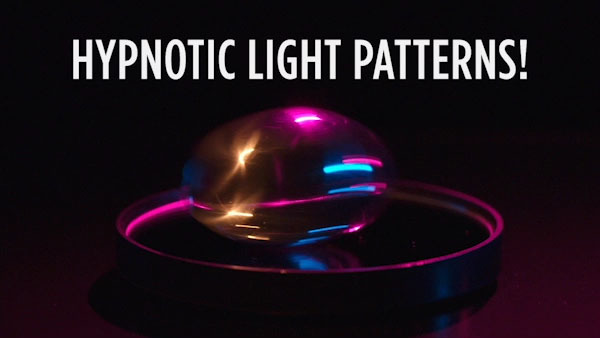 When PhiTOP spins slowly, you perceive it as a gelatinous ellipsoid—an egg made out of gel. But you’re not playing with liquid mercury or a floppy marshmallow-filled dessert. Believe it or not, it's a solid mirrored shape. 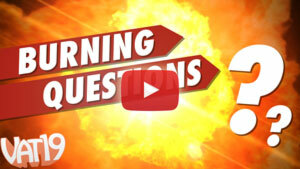 Question: Isn't this like Euler's Disc? Answer: They're similar in that they are both spinning desk toys that can go for a long time and demonstrate some interesting phenomena. Phi Top and Euler's Disc demonstrate different principles about the natural world, though, so it's best to check each one out to compare them and get a better appreciation for the world we live in. Question: Will it spin without the platform? Answer: PhiTOP is technically capable of spinning on any smooth, flat surface, but the included mirrored platform is designed to maximally enhance the effect and makes it easy to spin the top up.